ðŸ™Œ Exciting News to Come Alive in April! Itâ€™s time to come ALIVE in April! Are you feeling stuck in your health and fitness routine? Itâ€™s a new monthâ€” time for you to revive and renew your body, mind, and spirit! Today is the day! Read all of the exciting news below to learn about how to come alive this April! Donâ€™t forget to turn in your March calendar this week! We want to see how you stayed ABSolutely committed last month! You can bring your calendar into the studio, email us a picture to transfitathens@gmail.com, or text a picture to our staff. When you complete a monthly challenge and turn your calendar in, we reward your hard work with a prize! Be sure to check the schedule this week, as there are a couple of session cancellations and changes due to spring break! You can find great workouts to do while on vacation on our website HERE and on our app HERE! â€œI talk about God whispers and God winks often and I know He leads us through these little nudges. I know for certain that nothing happens by accident, but some days I want Him to speak audibly to me! I want and need clear direction. But then, I realize He is asking me to trust Him fully. 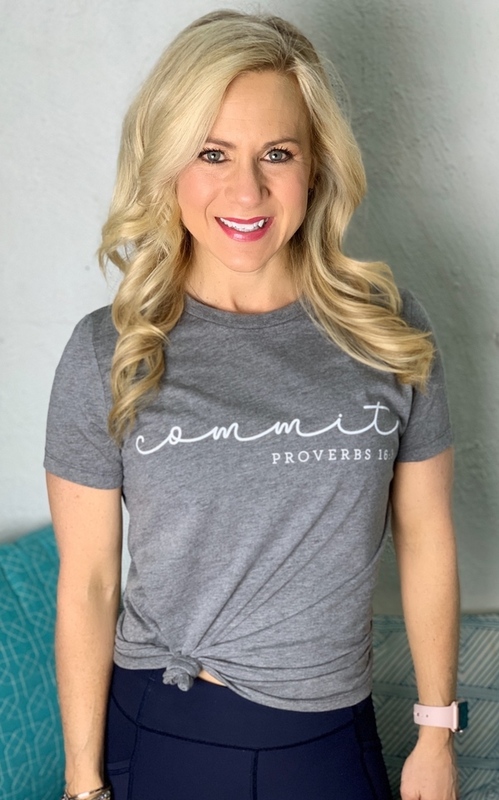 A wise friend recently told me, â€œCaroline, if you want to hear God speak to you, read the word of God out loud!â€� I donâ€™t know why this one sentence hit me so hard. The Bible is the written word of God and truth transforms! We have to read it, say it, and live it. The more I read Godâ€™s word, the more I feel its power and I began to understand Godâ€™s love for me. Today, with all the dismal headlines in the news, I find hope on the pages of His word and I find joy that sustains me in my weak moments regardless of my circumstances. Every time I make time to open the Bible it surprises me! Godâ€™s Word is alive and active because the Holy Spirit brings it to life! The Bible is a living book with a timeless message. The more we read it, the more Godâ€™s words fill us up and can pour out of us unto others. We find wisdom and guidance for how to deal with our busy lives, peace for our troubled hearts, and hope for the hardest moments. I want to challenge you to open Godâ€™s word this month and dive in with me. As Easter approaches this month, we encourage you to join the TransFit community in our April Bible Reading Plan! We will read through the book of Luke in one month and will transform our minds with His word. Download our FREE April Reading Plan ebook by clicking the button below OR get it from our website HERE! 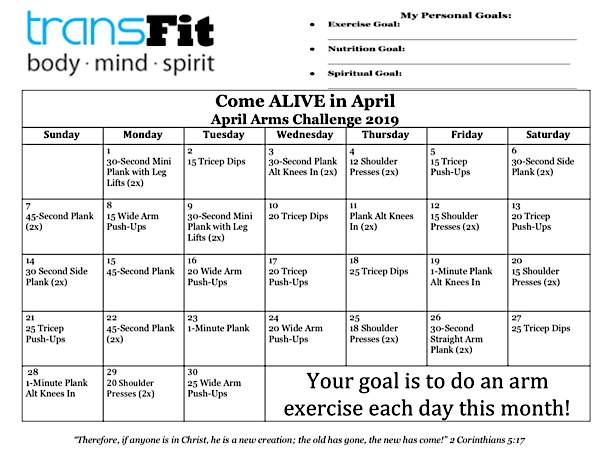 New month, new challenge and April is all about building strong arms! Complete these short arm workouts every day this month and color in each day on your calendar as you go. Share these calendars with us at the end of the month and weâ€™ll reward your dedication! If you have not registered for our Fit for a Miracle 5K yet, now is the time! Registration is $25 with a t-shirt for the 5K and $15 with a t-shirt for the Miracle Mile through April 26th, which is just a few weeks away! The race is scheduled to take place on May 4, 2019 at 5:00 pm. We will also have a Miracle Mile (1 mile fun run) at 4:30 pm. We are SO excited about this opportunity to support ESP Miracle League, which will provide transformative experiences for individuals with disabilities to thrive through the magic of accessible play and inclusive baseball. We have exciting news! TransFitâ€™s Director of Spiritual Development and Outreach, Pam Adams, will be leading prayer walks this month building up to our Fit for a Miracle 5K! Starting this Wednesday, April 3rd, meet outside the TransFit studio Wednesdays at 9:30 am where Pam will lead us in prayer and meditation as we walk the Miracle Mile route twice (2 miles total). The goal of prayer walking is to â€œpray onsite with insightâ€� as we will simply be using our senses to engage mind, body, and spirit in the ministry of prayer, keeping alert for how the Lord leads us to pray for the Fit for a Miracle 5k and the community around us where we will â€œset our footâ€� (Joshua 1:3) along the routes. Our greatest prayer is that God will be glorified as we seek the be a blessing to others in the ministry of prayer and service. Email Pam HERE if you have any questions! We had such an incredible time at our Healthy Running Lunch & Learn last Thursday! TransFit Running Director, Lisa Patton, taught us so many insightful techniques and tips for running/walking efficiently! If you want to learn more, Lisa leads a running group every Monday at 8:20 am. 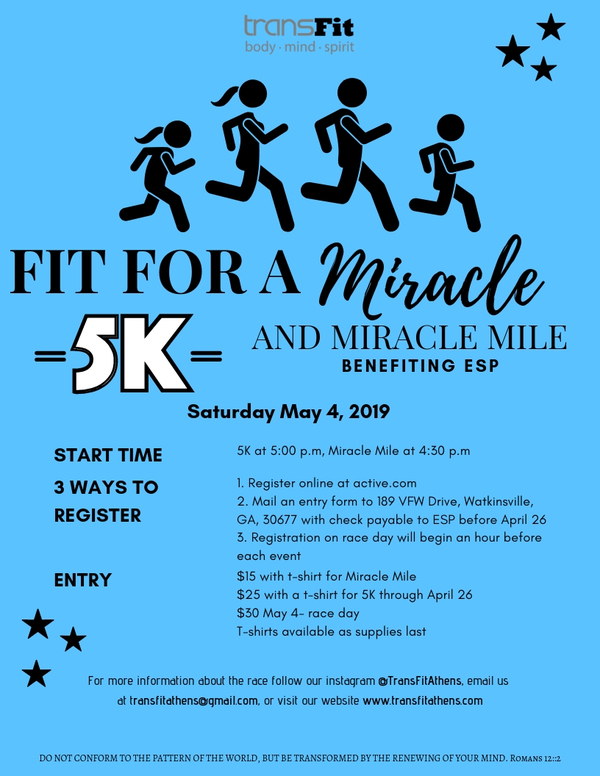 The group will be running parts of the 5K course, so this is an incredible way to train for our upcoming Fit for a Miracle 5K, as well as any personal goals you have! Email here HERE if you have any questions! We will continue to have our 5:30 am HIIT cardio sessions on Tuesdays this month! Getting in a cardio workout in the morning is such an incredible way to start the day! We will also continue our TransFit Girls sessions Wednesdays at 4:15! We love spending time with these sweet girls and helping them transform! You can sign up for any of these sessions on our FREE app HERE! Lisa Patton: As mentioned earlier, Lisa has a running group every Monday at 8:20! She is also available to train you or provide you with a plan to accomplish your fitness goals, whatever they may be! Want to run a 5k or a marathon? Lisa can create a plan to fit your needs. To schedule a one-on-one with Lisa, contact her HERE. Eliza Harris: Eliza is our new amazing personal trainer who is so excited to meet everyone and help them with their personal fitness goals. Email Eliza to schedule a one-on-one HERE! We canâ€™t wait to see you COME ALIVE in the studio this month! âœ¨ Amazing April Client Spotlight! âœ¨ Hereâ€™s How to Finish March with Energy!